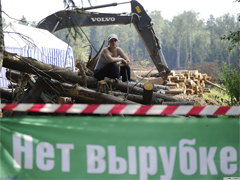 The Moscow city authorities are attempting to ban a concert protesting the ongoing destruction of outer-Moscow’s Khimki Forest, Kasparov.ru reports. The event is planned to be held on August 22 on Pushkin Square, and the mayor’s office had initially agreed to the event. However, a press release from the mayor’s office on Thursday stated that the organizers had only submitted the paperwork to hold a rally, not a concert. Organizer Mikhail Shneyder was told by the city’s bureau for event management and safety that there’s no way to hold a rally and a concert at the same time. “You’re announcing all over the place that you’re holding a rally-concert, but that kind of format for an event does not exist. You will not be allowed to hold a concert and set up a covered stage,” Shneyder quoted the bureau as saying. Regardless of any legal ambiguities, the organizers plan to go on with the show. Scheduled to be present are the groups DDT, OtZvuki My, Televizor, Padla Bear Outfit, and Barto. Journalist Artemy Troitsky agreed to host the event. Yury Shevchuk, leader of DDT and an outspoken Kremlin critic, said the band had already purchased tickets to Moscow and was coming to the event for certain. Yevgenia Chirikova, leader of the movement to defend the Khimki Forest, insisted that the Moscow authorities had no legal right to ban their event. “I don’t know a single law that would ban setting up a stage for a rally. The authorities’ quibbles are entirely baseless,” she said. The felling of the Khimki Forest began this past July. An expressway from Moscow to St. Petersburg is planned to take its place. Ecologists and activists have spoken out strongly against the project, insisting that it violates the law.